One day when I was a young’un, I visited the Orlando Public Library to check out some books for school. They had a small room with used books that they were selling for $1 each. I started combing through the bins and shelves to see if I could find anything interesting. That’s when I came across a teal, hardcover book – no jacket – with a squiggly 8-pointed star inside of a diamond engraved on the cover. The spine read, “The Silmarillion , J.R.R. 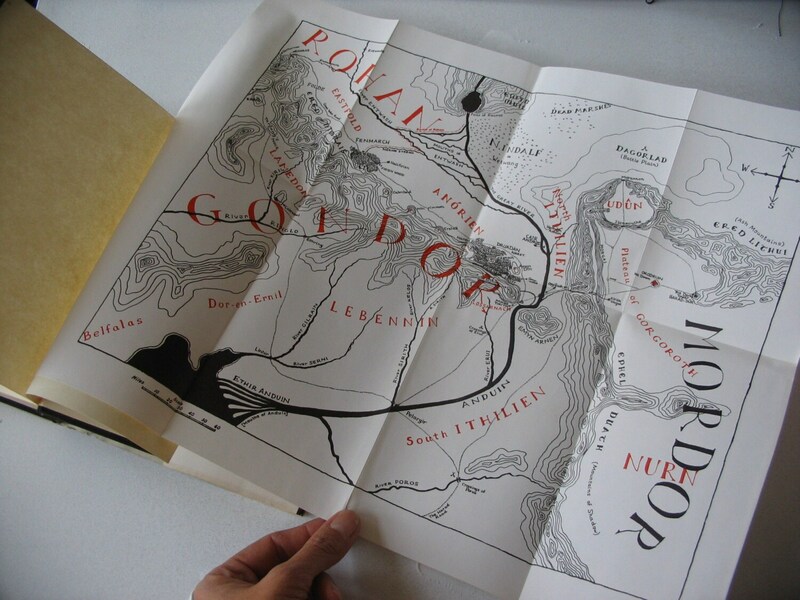 Tolkien.” Other than the absence of a dust jacket, it was in near-perfect condition. As I started to flip through the book, I noticed that the pages in the back seemed to have a gap between them. That gap, as I soon discovered, was a huge fold-out map of Beleriand – the ancient coast of northwestern Middle-Earth – before the land was sundered and engulfed by the sea at the end of the First Age. Of course, I bought the book, and still have it to this day. Best buck I ever spent. I still remember reading it for the first time, constantly flipping between story and appendices and map, immersed in the excitement of discovering a new world and new mythos. That was the day I fell in love with maps and realized the power they have to bring a story to life and to transport me to that other world. It also made me want to create my own worlds, my own stories. And, naturally, maps were needed to help define those worlds. Lots of maps. Town layouts scribbled on notebook paper; battle maps and building schematics on graph paper; overland maps spread across 20 sheets of typing paper that occupied most of the floor space in my bedroom. Thanks to Tolkien, maps and fantasy played a key role in developing my imagination, which has brought me a lot of joy over the years. So that’s my story… What’s yours? I’d really like to hear it, so I’m going to throw in a little incentive to help loosen the tongue. In the comments below, please tell me what is your favorite map, or a map that influenced you greatly. Also, share with me why you like it so much and/or how it influenced you. Feel free to link to the map if it exists somewhere on the Interwebs so we can all get a good look at it. On December 24th, I’ll pick one commenter and send him/her a $25 ProFantasy gift voucher that can be used toward the purchase of any ProFantasy products. It’s that easy – just leave a comment for your chance to win. Thank you all for sharing your stories, I thoroughly enjoyed reading them. I enjoyed them so much that I couldn’t pick just one as the winner. So, in the spirit of gaming, I rolled the dice (well, virtual dice from my Gametable install). And the Dice proclaim Anthony Toohey to be the winner. Merry Christmas to you all, and happy mapping! I think the Forgotten Realms maps of the 3.5 Campaign Setting book influenced me the most when it comes to making maps and creating campaigns. It showed me exactly what a campaign CAN be. The map showing the flow of goods and materials truly opened my eyes to how vibrant and brought-to-life any campaign can be. Yep, those are great maps. I agree – a good map can really help fill out a story, whether it’s an rpg or a novel or otherwise. I remember getting the Lord of the Rings trilogy for my birthday, but volume 1 and 2 were late and I was stuck with “The Return of the King” for a few days. I read the summary “What happened so far” at the start of the book and desperately tried to find the mentioned places on the book’s map. Of course I had no clue that the map in the third book shows only part of the world (Rohan, Gondor and Mordor). The only names that seemed remotely matching where “Morgai” (a mountain range in Mordor) with “Moria” mentioned in the text. I got really frustrated. Nevertheless, pouring over that map was really fun and influences me for a long time. All my early rpg overland maps were drawn in that contour line style. Yeah, those maps inspired me to do topographic styles early on too. One of my earliest maps was a sprawling mountain region that spanned 16 pages of typing paper all taped together. I would have to say that the T and O map shook my world view. Suddenly I understood what it meant to “orient” a map. Symbology and Art brought together to make something more. I feasted on maps after learning about this one, seeing how art and function combine to show us the world like we have never seen, to give us a better understanding of our environment. I changed my major to geography and then had a 14 year career with geographic information systems (GIS) before anyone knew what that was. I made maps that looked like real landscapes and some that were nothing but process captures but it was all fascinating. Now I make maps for my role-playing games. Here are a few. That’s a great real-world example and I like your comment about symbology and art – maps often fulfill more than one function. And thanks for sharing your maps. Nice work. (btw – for those of you wondering about the .FCW files, those are FastCad files and open with Campaign Cartographer). Ah, what memories! For me it was a combination of the two standard maps. When I was 12 I was given the gold box set of the Hobbit/LOTR. The maps in those two books enraptured me to no end. At the same time my mother got the blue box set of LeGuin’s Earthsea trilogy. I actually read those first, cover to cover, and was introduced to D&D by friends at school as I read. Funny how those things all ran together. I decided right then that I would someday write epic fantasy like these books, as well as the Narnia books I’d already read. I got a set of colored pencils and found a large drawing/art pad I’d been given sometime previous, and I drew my first map. It contained many place names I’d stolen right from those other two maps, such as Iffish and Venway 🙂 The map was more like LeGuin’s, in that I drew mostly islands around a smaller continent rather than a large landmass like Tolkien’s. Still today I have a copy of that earliest map. I ought to dig it out and scan it one of these days, just for fun. I haven’t looked at it in ages. I also have stacks of maps, notes, ideas, characters, scenes, and the like that have remained fodder for my writing, as well as finding their way occasionally into D&D sessions and campaigns from time to time. I will never forget the magic of those early maps and the inspiration they provided straight from the hearts and minds of their creators. The map that influenced me the most was yet another Middle Earth map: The poster map by Pete Fenlon that came with my Middle Earth Roleplaying (MERP) boxed set. As time went on, and I collected more MERP supplements, I found myself with more and more of Fenlon’s wonderful maps. His isometric symbols and icons, reminiscent of John Speed, remain the standard to which I hold other maps. The desaturated color scheme still seems like the only “correct” colors. Most other fantasy maps seem like poor mimicry of that work of art. I think a lot of the magic of that map for me was the vast amount of land depicted to the east of Mordor: lands that Tolkien may have referenced occasionally but never wrote about. The deep trackless forests from whence the elves migrated, the immense deserts of Harad, the dozens of names with no context, begging for stories to be told about them. I still have that map carefully folded away in a box of other MERP materials, mostly maps. It’s in rather poor shape—worn through along the folds—but I’d love to get it matted and framed some day when I have a room my wife will let me hang it in. Indeed, Fenlon makes a mighty fine map. In fact, one of the CC3 Annuals has a Pete Fenlon style pack. Since we probably won’t get Mr. Fenlon to make a custom map for us, this is the next best thing. I was always absolutely fascinated by the 24″ full-color light-up Nat’l Geographic globe and the maps that came in each of our Nat’l Geo magazines (as well as my World magazines – Nat’l Geo for little kids) – I can’t tell you how often my mom and I would read something, and it would mention a place, and Mom would say “Okay, let’s go find it on the globe!” Combined with a globe-trotting salesman for a father, we used that globe to death! And then I got the Greyhawk Boxed Set when I was twelve or so, after reading Narnia, Lord of the Rings series, the River of the Dancing Gods series, and so forth – and realized that a map didn’t -have- to be some place that actually existed! Let’s repeat that – you could make a map of some place besides real places! And I was hooked. As you mentioned yourself – there were maps everywhere. I quickly realized I have zero artistic ability, so my overland maps were, at best, utilitarian and primative – but dungeon maps – all straight lines on graph paper – I can run a pencil down a straight edge like nobody else! I still have a file drawer packed with old maps. I know I could recycle them, and never have to draw another dungeon – but why would I not want to draw another map?!? When I first started playing D&D almost no one used a map. Just kind of went with what was in their head. When I was 14 I started playing at the Scout camp I worked at (almost every night) and the DM of that game had a map. We only got to see it for like 30 seconds a session, and only if he felt we had to see it, but we had to memorize it in that 30 seconds, even if our characters had a copy of the map. Then I bought myself the 2e Boxed Ravenloft Campaign Set and in it was this beautifully colored map of the Demiplane of Dread. It was one of the first maps I ever saw that was professional quality but wasn’t a map of the real world. Wow – harsh DM! Fortunately for my PCs, I don’t want my maps to die in obscurity, so they usually get a copy at some point. A recent map that was a revelation to me was a polynesian navigation map. Made of twigs of wood lashed together, with cowrie and other shells at key intersections. It shows the angle of sea swells, locations of islands, and prevailing winds. In short, it provides all the information needed for a navigator to hop from one island to another across many miles of open ocean. It was a revelation, and is now a favorite map, because it is so true to its function, and so far from the maps that we usually think of. Great Article. The Lord of the Rings Maps influenced me as well but i prefer lightly colored maps. I was originally interested in map making when me and my cousins played games together. We always needed a map of our “kingdom” my older cousin was of course the king, we all admired him like one anyways! I was always chosen to make the map. As we got older i made more detailed maps until one day i decided to make a map out of for peices of paper covering about 100 miles. I put in details down to the last miniscule tree. Now i still make maps. My biggest infulence in continuing to make maps is still the same. Even though i am old my cousins an I still get together from time to time to play our game. My overly active imagination can allow me to sit down and imagine a world for hours and think about my journey through that world inside my head. I am odd am i not? I also like to roleplay online a bit and I am planning on making a detailed map for the site. Thanks for sharing your story Hunter. And no, you’re not odd at all (well, at least you’re no more odd than the rest of us). I think everyone on this site has an overactive imagination, hence our attraction to the fantasy genre, so I think you’ll find yourself in good company here. I know the drawing is over but I still have the winning entry. Best map ever… came in the “Revised Dark Sun Campaign Setting” box from TSR. Not only did the box have a giant map that greatly expanded the Tyr region that was so big it was printed on 2 full size (8 panels folded up) sheets but the crown jewel of all maps was also in that box. A cloth map of the Tyr region. Hi, I was wondering if you do any new one’s or if you make maps for people? I make new ones when I get the chance, but unfortunately that’s not very often. I can’t take on any commissioned maps right now, but many of my maps are free (click here for details), so you’re welcome to take an existing one and modify it to your needs. Also, you could put in a map request at The Cartographers’ Guild.